I would like to make you aware that the Connecticut Higher Education Supplemental Loan Authority (CHESLA), a quasi-public financial institution, will be accepting scholarship applications beginning today, Monday, April 1. CHESLA’s in-school fixed rate loan is available to qualifying students who attend non-profit higher education institutions in Connecticut and to Connecticut residents who attend non-profit higher education institutions within the United States. All eligibility requirements and required supporting documentation will be included in the application instructions. 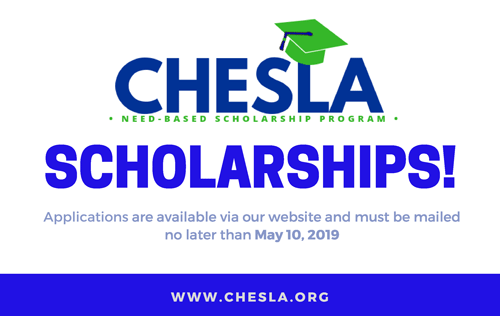 CHESLA awards scholarships to eligible students who have completed the FAFSA in pursuit of an undergraduate degree, or a healthcare or manufacturing certificate program in the State of Connecticut. To date, scholarships have helped 3,900 students achieve their educational goals. The scholarships will be awarded in July for the 2019-2020 academic year. Click here, or on the image below, to learn more.